The cost of books can often be a burden to college students, and at Pierce College, a two-year public institution with campuses in Washington state, students report that they either don’t purchase the required textbook (66 percent), register for a specific course (45.5 percent), take fewer courses (47.6 percent), or earn a poor grade because they cannot afford to buy the textbook (37.6 percent). To ease the financial burden on students, in 2015, Pierce College began offering open educational resources (OER) courses. In these courses, professors use materials that are openly licensed in the public domain instead of standard textbook options. During the session, “Institutional Business Services and Open Education Resources,” Choi Halladay, vice president of administrative services, Pierce College, explained the benefits and challenges of implementing OER. As part of Achieving the Dream—a network of community colleges working to build student growth—Pierce College has developed and implemented initiatives to help its students succeed. In an effort to help increase retention and graduation, the institution engaged faculty in the redesign of courses and degree programs by replacing the use of textbooks with open educational resources. These materials are freely accessible, openly licensed text, media, and other digital assets. Improving flexibility for teaching and learning. Improving educational experiences through improved pedagogy. Leveraging institutional investments, such as library, faculty expertise, and the overall learning environment. Since its debut in 2015, more than 10,000 students have taken OER courses and it has resulted in more than $2 million in student savings, Halladay said. Moreover, OER allows for greater faculty engagement, giving them expanded choices for how they teach and allowing them more involvement in the development of their courses. Once Pierce College evaluated the benefits to students and the college, there were other important areas to consider relating to finance, intellectual property, program maintenance, and disciplines. Intellectual property. When developing OER, you can implement IP either through public domain, open license, institutionally owned, institutional license, or fair use. The safest of these, Halladay said, is public domain, but fair use is a “wonderful gray area that can be used to better serve students.” It’s important for institutions to have an in-house copyright agreement expert, because while fair use can better serve students, it is the riskiest because of how the law is written and interpreted. Faculty involvement. At Pierce College, faculty are allowed to create their course materials. In instances where a faculty member is paid for producing work, he or she is the sole decision maker on how the research/work will be shared and licensed. As employees, do faculty have the rights to what type of licensing they will put on their work? Policy issues. Consider the issue of open licensing and student work. Do students have a choice on how their work is licensed? Do you have a right as an institution to ask students to put their work in open and public spaces on the Internet? Course selection. Not all courses do well in an OER format. Consider which disciplines will and won’t work using open resources. Halladay said that the art and humanities classes are much more difficult because of the license issues. However, since math and science courses are more fact-based, it is easier to get that content on the Internet. Make it sustainable. Before rolling out OER, Pierce College followed the same model used at Tidewater Community College—increase enrollment and registration numbers. “Do the work in the beginning,” Halladay said. As more students register, the loss of revenue from book sales becomes more manageable. OER courses at Pierce College also have a small fee between $2 and $5, which is enough to maintain the course model. Think about how to increase enrollment and what fees, if necessary, will be needed to maintain OER on your campus. Consider, too, the platform for delivering these resources and how they will be updated going forward. 1. Direct expenses. Who is going to pay for the material to be created? Someone has to package it in a way that makes sense for each individual class. 2. Revenue and relationships. What does it do to bookstore revenue? Pierce College has seen a $2 million decrease in bookstore revenue in the last two years. Not only is revenue decreasing, but it is changing the college’s relationship with its bookstore provider. Find other ways to maintain that relationship. 3. Cost of attendance. Make an effort to increase enrollment. What you lose in textbook sales, you will make up for in tuition. By taking this approach, according to Halladay, even though you lose, you gain. KHESIA TAYLOR is deputy editor for Business Officer. 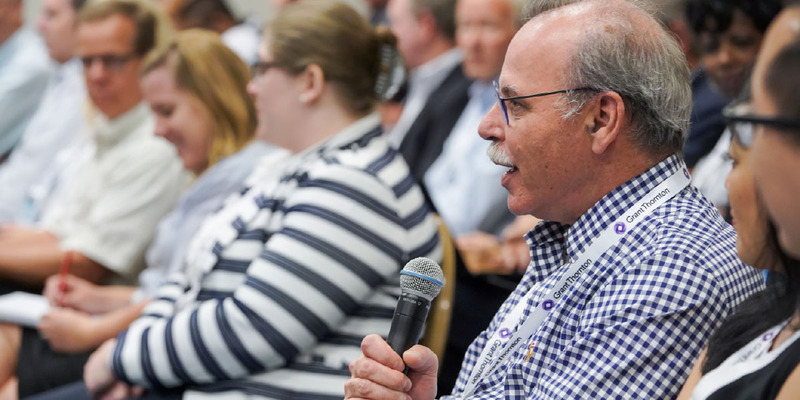 Has your institution’s financial plan ever been derailed by an unfortunate misunderstanding or misinterpretation?” More than half of those attending the session, “Getting Financial Plan Buy-In From Non-Financial Constituents” answered yes to that pop-up poll. In truth, an institution’s financial strategy impacts more than the bottom line. Financial decisions also influence public perception, student experience, enrollment, fundraising, and much more. That’s all the more reason that finance professionals must accept their role in helping others understand what’s behind the numbers, the session’s presenters said. Also crucial is how information about the institution’s investment of resources is communicated to a diverse set of stakeholders that may include faculty, staff, students, alumni, trustees, legislators, the larger community, and the media. Consider embarking on the largest construction project in the history of your institution that will total more than $360 million. Washington University in St. Louis, Mo., undertook the East End Transformation project, with construction beginning in 2017 at the literal front door of this private institution of approximately 14,000 students. As a leading medical research institution in the region and as the third largest employer in St. Louis, it was crucial to get the messaging right, said Amy Kweskin, vice chancellor for finance and treasurer. And there were plenty of concerns and questions—especially related to plans to do away with 1,000 above-ground parking spaces in exchange for a 790-car capacity underground garage. Other components of this massive project included three academic buildings (two engineering and an art/architecture complex), a new welcome center, and additional green space. This didn’t start out on such a grand scale. Around 2008, university leaders began communicating with rating agencies about an underground parking garage. That idea was put on hold due to the emerging financial crisis, though project planning continued. By 2014, other academic priorities had emerged for the university, and so leaders began planning how to bundle a multibuilding project with the underground garage to realize significant economies of scale in tackling both needs at one time. In the end, this would not only be the most cost-efficient approach, but it would also address a major concern of the chancellor to mitigate the total construction disruption time, Kweskin said. With a goal for project completion by May 2019, the financial incentive for the all-in financing strategy was the ability to lock in a 30-plus-year rate of 3.652 percent for $265 million in external funding, Kweskin noted. The potential for significant savings became a big part of the story for communicating to diverse stakeholders the “why all at once” question. University leaders also understood the need to exhibit good stewardship of resources to constituents. A core requirement for the underground garage was thinking through how to build the new space in a way that it could be adapted down the road—perhaps converting it into classroom or administration space, since in reality, no one knows what transit might look like even 10 years from now, Kweskin said. 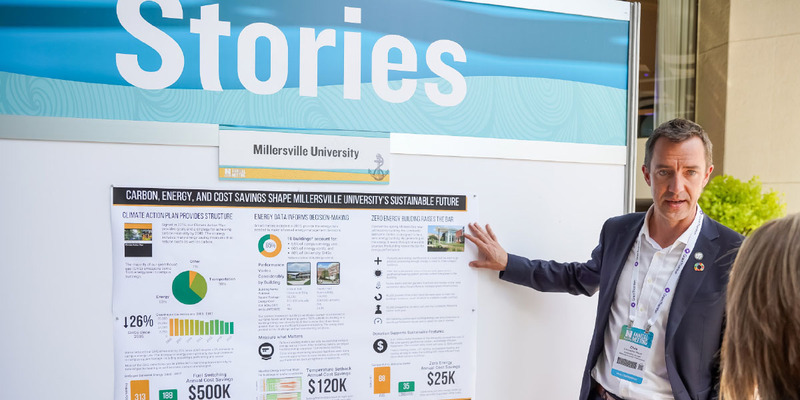 With a project this big, this disruptive, and this expensive, the university had to ensure that everyone involved and everyone with a stake in the project’s success understood not only the what, but also the why behind this, Kweskin said. And, a solid communications strategy had to be hammered out well in advance, because once the university broke ground, it would mean a dump truck leaving campus every 90 seconds with more than 1,000 loads of fill dirt every day. And then, after hitting rock bottom, 112 trucks would pour concrete without interruption for 12 hours, Kweskin explained. University leaders likewise understood from the start that the success in getting the project off the ground would be telling the story in a way that provided others with a clear picture of what everything would look like on the other end of breaking ground. One hurdle was helping others understand how this transformation would retain the iconic value of Brookings Hall, an emblem of the institution built at the turn of the 20th century. Residential neighborhoods surrounding the campus likewise had concerns. The university hired a communications manager focused solely on this project in part to keep the larger community and visitors informed about the various phases of the disruption and what to expect. A webcam and Twitter updates help keep everyone apprised of what’s happening now and what will come next. Because of the disruption to parking and transit, the university launched a shuttle service and created a shuttle app so that users know when it’s inbound. Beyond the immediate financial concerns, Kweskin said the project has required ongoing care and attention to a host of other questions, necessitating a broad communication strategy that depends on a unified message coming from senior administration, parking and transit staff, student affairs, public affairs, government affairs, and board members. Chris Malins, associate vice president, treasury office, University of Washington (UW), Seattle, believes that the higher education model requires particular attention to providing clear and concise financial communication for several reasons: Colleges and universities operate within a shared governance culture, often within a decentralized environment, where C-suite expertise is not always financial or business focused, and where decisions made can have huge economic impacts for the institution and its larger region. 1. Context: Create a communication framework. Consider whether a group is gathered to take in information or to take action based on the information you provide. 2. What and why: Identify what it is and why it’s important. Provide background about prior decisions, actions, approvals, and endorsements so that others better understand next steps. 3. Essence: Separate the wheat from the chaff. While the tendency may be to share everything, prune the material to its core. Ask whether what you will share has a logical flow and whether it bolsters the argument or is redundant. 4. Continuous attention: Present information clearly, and modify as needed. Pay attention to body language and questions raised as indications that you may need to modify your message. Make these easy to read at a glance with important information (e.g., what you owe, at what rate, for how long) clearly highlighted. Place information in context by breaking the information into eras (e.g., the past 10 years) that show comparisons to what has happened, what’s projected, and performance in relation to peers. Use consistent colors and text fonts throughout a presentation (and throughout all finance-related presentations and materials) to help create a unified brand. Think in terms of how information is most easily digested by those without financial backgrounds, and incorporate concepts that they will understand. For instance, Malins has used imagery of a checkbook register to show debt capacity with a beginning and ending balance. Ask yourself: Does this slide tell the story or does it require a lot of explanation? For Malins, every slide should stand on its own without further explanation. Institutions can benefit greatly through the services of an internal consulting group to advance organizational effectiveness across their academic, research, and administrative functions. The staff at Georgia Tech Strategic Consulting (GTSC), Georgia Tech, Atlanta, does exactly that by working with the entire institution on campuswide initiatives and partnering with individual units to develop organizational improvement strategies and solutions. At the session, “Driving Excellence From Within: Mobilizing an Internal Consulting Team,” Sonia Alvarez-Robinson, executive director, office of strategic consulting, said that the consulting group has five areas of focus: strategy development and implementation; organizational design; project and portfolio management; process optimization; and community building and readiness. The group, which consists of a diverse group of professionals who have worked in varied sectors and have a range of certifications, helps build readiness and agility around the campus. “Our philosophy is that we will never be enough [staff members] to do all the work. Our role is to develop the tools and methodologies to get the work done through organizational leaders within the units and departments,” said Alvarez-Robinson. Because the unit gets many more requests that it can handle with its staff of 14 consultants, it uses a discerning intake process, where each project is required to come from the executive level, and also has to be enterprisewide. A networking forum allows the consultants to share project management principles that departments can use themselves and for campus staff to become change agents. A competency toolkit with templates and resources can also be helpful for departments taking on projects. The group also launched this year an annual conference (www.oe.gatech.edu) for campus staff, private companies, and other universities to learn ways to work more efficiently and effectively by sharing tools, resources, and best practices. The consultants were able to reach out to all the campus leaders and stakeholders that needed to be part of the conversation and decision making, and ensured that we got the highest value of dollar from external consultants, Hoeting said. They provided the technology governance perspective and gave us the tools that we need and then started to incrementally disengage. PREETI VASISHTHA is editor in chief for Business Officer. 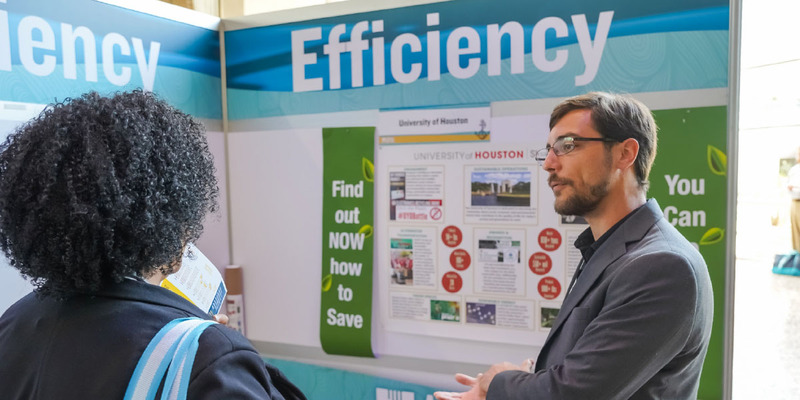 The annual meeting attendees had an opportunity to study the 40 Campus Efficiencies Posters highlighting a variety of accomplishments from small and large campuses, as well as two systems. The 2018 posters were showcased outside of the main general speaker area. These posters, as well as other posters depicting success stories from 2014, are available online at www.nacubo.org/campusposters. Topics include carbon neutrality plans, composting, collaborations, budget processes, energy efficiency, science lab retrofits, energy savings contracts, water savings, and more. 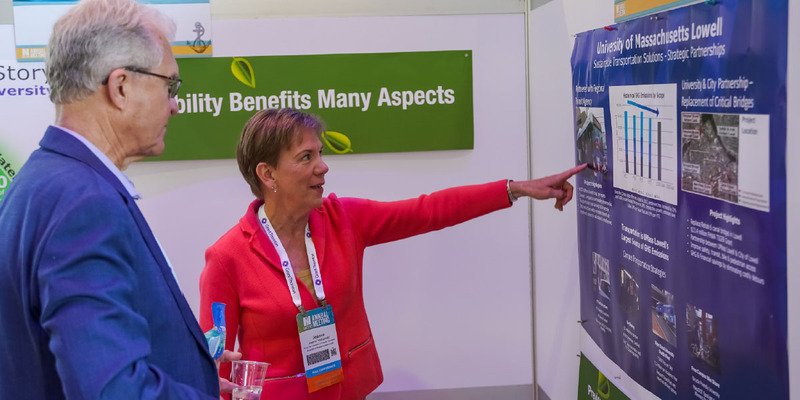 NACUBO is accepting proposals now until Jan. 31, 2019, to register to present a poster and receive a discount for the 2019 annual meeting registration. (Discount is not applicable if already registered.) 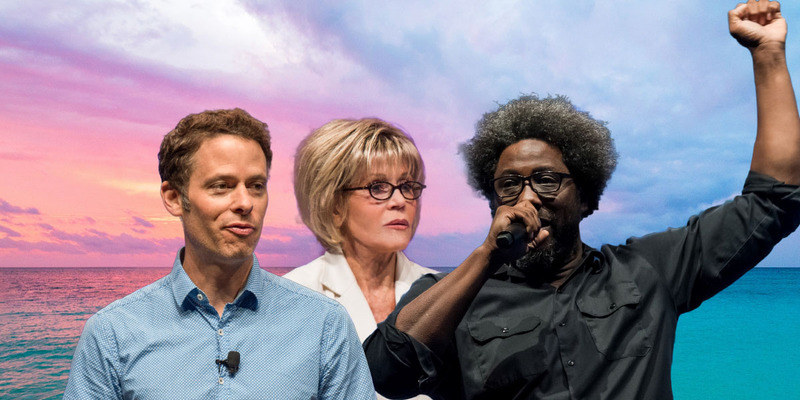 For details, visit the 2019 NACUBO Annual Meeting website at www.nacuboannualmeeting.org. 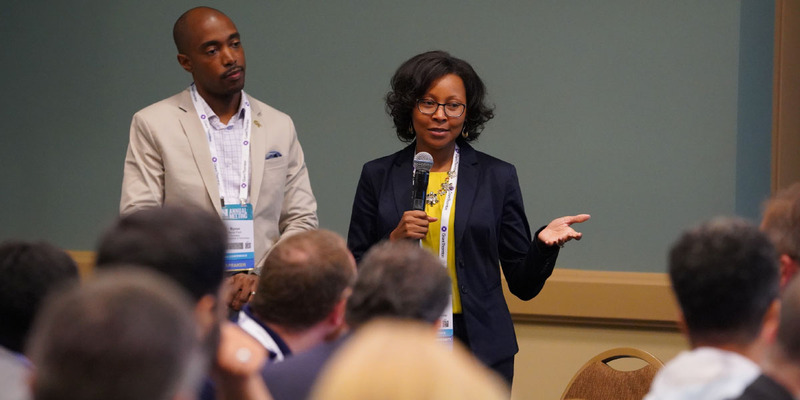 At a new event added this year, 10 vice presidents from a diverse range of campus types, sizes, and regions, who are part of the NACUBO sustainability advisory panel, gathered to answer questions from members at the LAB in the expo. They discussed a range of topics with members on a one-on-one basis. Topics included energy savings contracts, integrating utility infrastructure and deferred maintenance, adaptive reuse, science labs, whole building retrofits, master planning, facilities administration, and renewable energy. This one-hour session allowed for in-depth questioning and personal connections from knowledgeable NACUBO peers.